Bedtime is one of my favorite times of day. And I hate that I am always the one taking pictures instead of snoozing on the couch. i don't know ... they look pretty comfortable without you. and i love her 'fro. 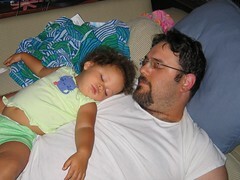 that 'fro was pretty hard-won -- this picture was taken on a night when we COULD NOT get her to go to bed. i love her belly just hanging out..